In this week’s Martin and Sylvia: Saturdays! story, “A Hunting Morning”, Laura is visiting the Browns next door, and Martin and Sylvia are invited over for buttered popovers. Mr. and Mrs. Brown then decide to set up a ‘popover treasure hunt’ for the three children where they need to use their noses to find the tasty treats. When the hunt begins, however, the children are surprised to find they are not the only ones doing the hunting! For the longest time I thought that you had to have a special pan to make popovers, so—not wanting to clutter up my kitchen with a one-trick pan—I simple never made them. But, did you know that you can make popovers in a normal muffin tin? It’s true! 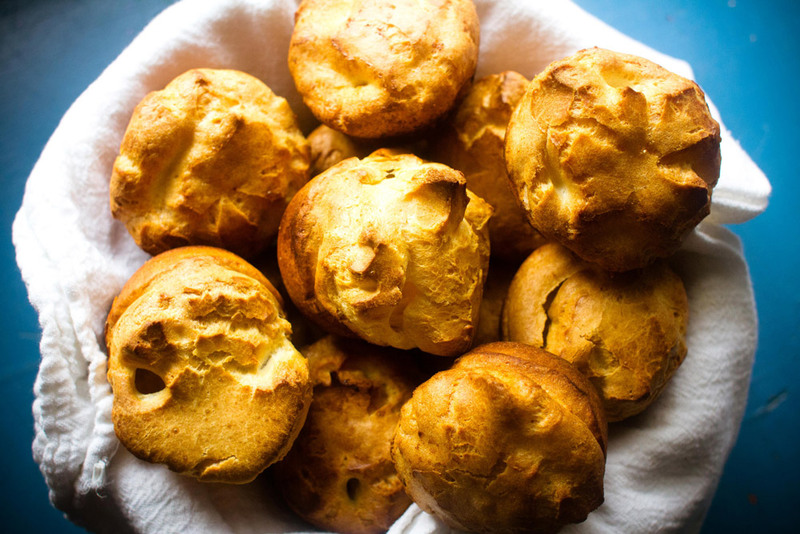 Popovers made in a muffin tin won’t reach the sky-high puffiness of those made in a proper popover pan, but they’re still plenty billowy to scoop up your favorite filling. No matter what kind of pan you use, the key is the same—do not open the oven door during the cooking process. Popovers rise because of the steam created as liquid evaporates from the super light batter. 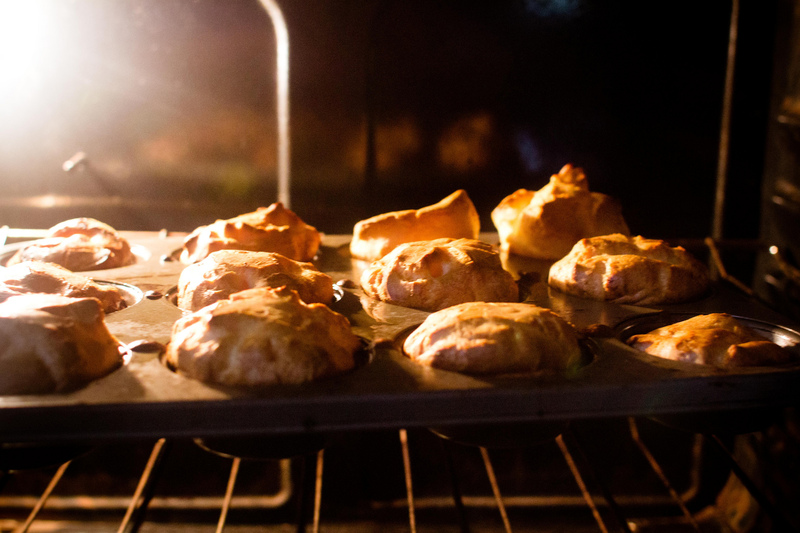 Opening the oven door for even a moment lowers the oven temperature resulting in less steam and deflated popovers. It’s so tempting just to peek in, but do yourself a favor—make sure your oven light bulb is working and keep your hands away from that oven door. When you have a piping hot, pillow of a popover in your hand at the end, I promise, it will be worth your patience! Using a food processor if you have one (and a sturdy bowl and whisk if you don’t), combine the milk, eggs, and 1 tablespoon of the butter. Once those are mixed throughly, add the flour and salt and process until the batter is a little foamy. Meanwhile, heat your oven to 450 degrees. No cheating here, make sure it’s fully pre-heated before you go any further. When the oven is hot, pour the rest of the butter equally in to the wells in the muffin tin and put the whole thing in the oven for about 3 minutes. Give the batter one last good pulse, then carefully pull the hot pan out and divide the batter among the wells. Put the pan back in the oven for 15 minutes, and do not open the oven door. Reduce the heat to 350 degrees and bake for 15 minutes, again, without opening the oven. When the popovers are fully puffed and sound hollow when you tap the top, run a butter knife around the edge of each one to get it to release from the pan. Eat them while they're hot with extra butter or your favorite jam. Saturdays are special days for our creative brother and sister. From enormous art projects in their own backyard to "explorers" adventures up Mooseberry mountain; from mornings of quiet building along the creek, to whole-family canning adventures in the kitchen, the children find fun and inspiration at every turn.